In my last post about pesticides in wine, I mentioned that I had been making my way through a French study on the subject. Finally, it’s time to write about it. The study was conducted by Que Choisir, a French consumer organization, and released in September 2013. ** The news accounts that followed all focused on a few points: 1) There are no standards for amounts of pesticides permitted in wine in France; 2) At least one pesticide was detected in every wine tested; and 3) The total didn’t amount to levels that would cause concern. Reading the original (in French) and some of the supporting documentation, I think the study is far more significant than the news reports indicate. As I wrote last time, the U.S. has no standard for pesticides in wine either. The U.S., like France and the E.U., has pesticide residue standards for grapes but not wine. And while TTB, the federal agency that regulates alcohol in the U.S., randomly tests wines for 150 pesticides each year, the Que Choisir study names names and gives concentrations — data I have requested, but not received, from TTB. While there are some limitations on the amount of data for certain wine regions and categories of wine (organic wines and rosés, for example), these are the kind of data we should have for wines in the U.S. It must have cost Que Choisir a huge amount of money to do these tests and produce the report, which is probably why we haven’t seen a similar one here. “Pesticides” includes insecticides, fungicides, herbicides, and chemicals to kill/ward off rodents, as I mentioned in my last post. So finding a “pesticide” in wine doesn’t mean it was an insecticide in there. For the most part, chemicals detected were fungicides. With a few exceptions, the application of substances found in this study was standard practice. You’ll see two particular words used here — detected and measured. With the tests and instruments used to do the tests, there’s a limit of detection (where you know it’s there but not exactly how much), and a limit of measurement (above which you can measure how much is there). Detection means a concentration between 1 and 10 parts per billion (ppb). 10 ppb is the minimum concentration that can be actually measured. For presentation, Que Choisir added up the number of pesticides detected and measured in each wine — although the data are also available separately. So the numbers in the table I made (below) are for that total number of detected + measured (after all, they’re detected if they’re measured). They also added together concentrations for the measured pesticides, even though there might be five different pesticides measured in a particular wine, including insecticides and herbicides. This is pretty much standard practice when reporting concentrations of pesticide residues. I compiled the data from Que Choisir’s study by region to make this chart. I can’t believe I’ve been blogging for so many years without including a data table. Makes me feel like an engineer again! So here’s my take on what Que Choisir did, what they found, and what it might mean for wine drinkers. Which wines were tested? Que Choisir tested 92 wines, selected from nine wine regions or appellations across France, and focusing on wines that people consume daily. The price ranged from 1,60 to 15 euros, or $2 to $20. So the prestige wines that you’ll find reviewed in magazines weren’t there. Many of the wines were available in supermarkets, although not necessarily purchased there. Full disclosure: None of the wines imported by First Vine was tested by Que Choisir. Which pesticides were tested? Wines in the study were tested for 165 different pesticides or breakdown products of pesticides. Of these 165, 33 different substances were found. Three of the wine samples tested contained residue of a particular pesticide not allowed for use in France or the E.U., and a fourth contained residue of a different pesticide that’s also not allowed for use. Were organic wines tested? Nine of the 92 wines were labeled organic, or just under 10%. Interestingly, according to the New York Times, 8.3% of the wine produced in France in 2012 was organic, so this was a good sampling in terms of the overall mix. This study also shows that it’s possible to find organic wine in France at everyday prices. What is the overall finding? As was reported in the news accounts, pesticide residues were detected in every single one of the 92 wines tested. Twelve of the wines (or 13%) had no measurable pesticide residues, although residues were detected even in those wines. What’s the overall finding for organic wines? Six of the 12 wines with no measurable pesticide residues, or 50%, were labeled organic. In contrast, just 7% (6 of 86) of the non-organic wines tested had no measurable pesticide residues. The fact that every organic wine had at least one detectable pesticide residue is likely due to two factors: use of the chemicals in the surrounding area, and previous use of pesticides on the property (since some of them can persist in the soil). The 50% vs. 7% having no measurable pesticide residue is encouraging, but there needs to be more work to pin it down. As far as I know, these are the first data examining pesticide residue in organic and non-organic wines. How big was the geographic variation in selection? Only three of the nine wine regions had 20 or more samples: Bordeaux, Côtes du Rhône, and Languedoc-Roussillon. The others had seven or fewer wines tested. In the case of two regions this was probably because of price — Bourgogne and Champagne make more expensive wines. There are also some pretty pricey rosés from Provence and wines from the Loire, although there are certainly enough inexpensive ones that would fit this survey. The percentage of total selections from each region doesn’t track with wine consumption in France as a whole, and not every wine region was included. What was the geographic variation in results and how can it be explained? Looking at the three regions with the most selections tested, Côtes du Rhône had the lowest percentage of detections of more than five pesticides, and the lowest percentage of wines with total measured pesticides of 50 ppb or more. Languedoc-Roussillon and Bordeaux were pretty close to the Rhône for pesticide detections, but higher in terms of measured pesticides of 50 ppb or more. Climate is probably the main reason for this. Both the Rhône valley and the Languedoc are hot and dry in summer, compared to Bordeaux. I would have thought the Rhône Valley and the Languedoc would have tracked more closely, so I was surprised to learn that a greater percentage of samples from the Languedoc had residues totaling at least 50 ppb than the Rhône Valley. When I visited the Languedoc in 2013, the climate and terrain were touted as being particularly suitable for less chemical intervention. Perhaps the vintages were atypical? I’ll have to do some more checking to see. One other thing stands out to me. Three of the four wines from Provence tested were rosés. Rosés sit on the grape skins for much less time than red or white wines do, and there were many fewer detected and measured pesticides in the three Provençal rosés than in wines from other regions. This makes sense if the majority of pesticide residue is on the grape skins, rather than in the juice. Provence is also hot and dry, so climate probably played a role in the result. A glance at the data for five of the other six rosés tested looks good as well (sadly, one was a real doozy), although there aren’t enough data on rosés here to do a real statistical analysis. Was there a difference between red and white wines? While the study says that whites contained more than twice as much pesticide residue on average as reds (242 vs. 114 ppb), I think the difference in this study is due to just a handful of white wines examined that had much higher levels of residue than the other whites. Still, it makes some sense overall that red wine grapes might require less pesticide applications. Red wines are often described as having aromas and flavors of tobacco, which contains some natural insecticides. Tannins, found in the skin of red wine grapes, can also have some effects on reducing pests and possibly serve as fungicides too. Of course, fungicides sprayed on grapevines are as much to keep the leaves from rotting as the grapes, so there’s only so much the grape skin tannins can accomplish. Do the levels of pesticides found pose a health risk? Obviously, finding two banned substances is unacceptable. As for the rest, I’m going to have to say I don’t really know. If I had to guess I’d give it a qualified no, provided that wine was one of the few sources of pesticides in a person’s diet. Que Choisir points out that the concentrations found in some of the wines with the highest totals wouldn’t be allowed in drinking water — also that most people drink more water than wine. But after reading this study, I will think carefully and try to avoid routinely drinking wines that contain greater amounts of pesticide residues and routinely consuming foods higher in pesticide residues. Of course, this only works if you know more about the wines and foods you consume. Que Choisir endorses the suggestion of another French NGO that wineries should voluntarily submit samples for testing, and wines with less than five detected pesticides and total concentrations less than 50 ppb could be eligible for a special label. I think it’s a great idea, although it would be good to know who applied but didn’t get the label. One final thought: This is one study, a snapshot in time, and if it were repeated today the results could be different. Still, I hope that the producers in the various regions will do some more detailed studies to identify wines with greater numbers and levels of pesticide residues and find ways to reduce the totals. In the meantime, though, I’ll continue to press TTB to provide data on its annual testing. And I have to say that as an importer of some southern Rhône wines, I’m pretty excited — preliminarily, of course — that the region came out well in the study. I didn’t need another reason to like the wines, but this is definitely an encouraging one. ** Que Choisir, 518, October 2013, pp. 46 – 50. 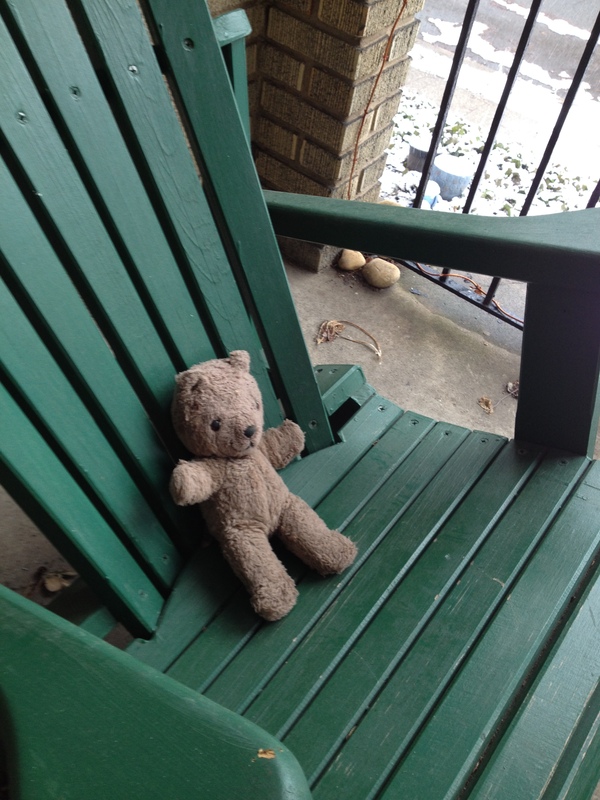 Our porch bear is happy the snow is gone. We are too, so we can sit outside and enjoy our wine! It’s finally spring, at least most of the time. This means that Cy and I get to sit on the front porch instead of inside the house for our Friday evening snacks and drinks. And instead of cheese and olives, which we seem to crave in the winter, we’ll want a lighter snack. We’ll probably still drink red wine for a bit, since these are not the really warm DC nights we’ll be having in a couple of months. This week’s recipe for nuts roasted with herbs will do the trick. Rather than using a lot of oil to coat the nuts and get the herbs, salt, and pepper to stick, I like to use egg whites plus a little oil. You can really use any herb you like, fresh or dried. I use dried thyme since I always have it around, and fresh rosemary (since it generally survives the winter). This version makes 2 cups of nuts, about a half a pound, which will easily feed 6 people pre-dinner. You can cut the recipe in half if there’s just a few of you. While you could pop the leftovers in the freezer and then bake them until warm, I think they’re better fresh. So it’s probably a good idea to make less rather than more. For wine, a southern Rhône red (you thought I’d recommend something else in this post? ), medium-bodied, no oak. Plenty of those that fit the bill, but I’m thinking of Cave la Romaine Côtes du Rhône Villages Séguret ($15) for this Friday. It’s medium-bodied, 70% Grenache, 30% Syrah. Perfect for that transition to warm evenings. In a large bowl, combine the egg whites, salt, pepper, and dried thyme. Beat with a fork until you get a little foaming of the egg whites. Beat in the oil, then stir in the nuts. Make sure the nuts are all well-coated. Pour the nut mixture onto the baking sheet and spread the nuts out a bit so they’re just barely not touching each other. Sprinkle the chopped rosemary over the top. Put the pan in the oven for 5 minutes. Then take the pan out and scrape up the nuts with a spatula to make sure they don’t stick and break up some of the crust. Bake for 5 more minutes, or until everything’s lightly brown and smells beautifully. Taste one of the nuts for salt, and sprinkle with a bit of coarse salt as needed. Serve warm or at room temperature. This entry was posted in Musings/Lectures/Rants, Pesticides in French Wine, Pesticides in Wine, wine delivery washington dc and tagged buy wine online dc, Cave la Romaine Côtes du Rhône Villages Séguret, Côtes du Rhône wines, Pesticide Data in French Wine, Pesticides in Côtes du Rhône wines, Pesticides in French Wine by Region, Pesticides in Wine, Que Choisir, Toasted Nuts with Herbs, Tom Natan, wine delivery washington dc. Bookmark the permalink. Good Job !! Love it ! They should test prosecco and Champagne though. Thanks! They did test four champagnes — the 15 euro limit on price was probably why they didn’t do more. But I agree, it would be great to have data like these on all wines we drink. Yeah ! I worked for a winery that produce prosecco DOCG and DOC and I also produce a small amount of Col Fondo prosecco. The problem is that even if you try the organic or ( more complicated ) biodynamic wines , all the surrounding areas still use Pesticides and chemical substances so, it’s quite frustrating sometime . However , to be honest , it’d really hard to produce a good wine without the help of the some substances. There are a lot of factors to count : lost of production , less yield per hectar, weather changes and so on . I totally understand. Drift and cross-contamination is a real issue. Also, many of my producers use fungicides when they need them, particularly if there’s a lot of wet weather. I agree that it’s far better to use some of these things judiciously than lose your crop. And I don’t believe that wine grape growers necessarily use these substances in a cavalier manner. However, it’s also important for producers and consumers to understand how pesticide use affects the final product. Regarding the detection of pesticides in organic wines I would like to point out that organic certification does not preclude using pesticides. It does regulate which pesticides can be used, and how they may be used. Since the report didn’t specify what pesticides were found in organic wines, they very well could have been allowable pesticides for organic production. Thanks, Diane — yes, it’s true that some pesticides can be used in organic production. My two producers who make organic wines use various substances approved for organic certification, generally not what we think of as synthetic pesticides. As far as I can tell, the substances they use are not regulated by FIFRA (the pesticide law) in the U.S. and I presume they were not included in the totals in the study. I may be wrong about that, though, and I will certainly try to find out. If you are ever visiting Santa Barbara CA, you might find it interesting to stop by and review with me the actual Pesticide Use Reports kept by the County. I have compiled this information. It might shock you. Thanks John. I’m sure those data would be fascinating to see. End use data are something I haven’t explored yet. Organic grape farming has high negative impacts and should be avoided. The organic pesticides that are used in very high amounts in California vineyards are actually synthetic substances. You may say they are “generally not what we think of as synthetic pesticides”, but you would be incorrect because Stylet Oil, Sulphur and copper used in organic vineyards are definitely synthetic. Stylet Oil is highly refined petroleum and has a very negative environmental impact, as the organic farmer is essencially spraying petroleum all over the vineyard and this application is repeated many times during the year. By the way, Stylet Oil kills beneficials such as ladybugs and has all the negative environmental impacts of petroleum but the amounts used in the organic vineyards is huge. The sulphur used is also a synthetic pesticide and is a petroleum waste product synthesized into a pesticide. The organic copper pesticides are also synthetic and is a heavy metal, which are quite harmful. Any organic grape farmer who claims not to use synthetic petrochemical pesticides should produce the Pesticide Use Report filed with the County. The organic and biodynamic vineyards I have pulled the PUR reports all show large amounts of these environmentally damaging pesticides in persistent use. I can only speak to the data I have seen from my French and Italian producers and what they are required to report for their organic certifications, and don’t have any experience with U.S. data. However, I have always been skeptical of some of the substances approved for organic or biodynamic agriculture; the idea that because the substance is found in nature somewhere it’s OK to manufacture it on a large scale and use it strikes me as short-sighted. This all has one cause. GMO vines and worse, densely planted.. There has been much research on this worldwide. Santa Barbara like all of Napa derives from genetically mutated hybrids of different species. When Napa and the rest of the world had real vines, non-GMO… these problems did not exist. I can’t believe we’re wasting time fretting about residue levels of anything in parts per billion. With measurement and detection at such low levels it would be helpful to know the rate of false positive and false negative. In a clinical setting these results are referred to as mud values. Very hard to distinguish the target from the mud. Thanks for writing. Personally, I see this as a right to know issue. What you do with the information, and whether you choose to fret or not, is up to you. TTB’s annual survey of pesticides in wine provides us with no information other than that no unregistered substances were found and nothing exceeded the standard. This is a huge improvement. I can decide what I’d like to do based on what’s presented. As far as the values, I have a little more faith in their accuracy and reproducibility because I’ve had to commission data like these, and have run tests like them myself. But it’s a fair point, that when you get to very small concentrations it could indeed be “background noise” or some sort of contamination. Richard, you are absolutely correct. The real risks is food borne illness, it is not pesticides and it is not genetic modification. Food borne illness is a real threat that kills and injured hundreds of thousands each year. Pesticide discussions are important when analyzing sustainable practices, and by the way, organic farming per the NOP fares poorly in respect of sustainability. I suppose this depends on your view of sustainability — which I believe has a lot to answer for in terms of actual environmental protection. For example, I farm my vineyards under the SIP Sustainable Certification my overall EIQ for 2014 was 362. Compare that to the overall EIQ of 1,360 of a vineyard very near me, which is Certified Biodynamic by Demeter, and also Certified under the National Organic Program and oddly also SIP Certified (but unable to use the new SIP approved low risk pesticides because of they are “synthetic” and disallowed!). You need to study the EIQ analysis to appreciate the holistic view EIQ uses. But as many as 12 fungicides were found in one bottle! Then the chemicals compound and then get really wacked out with the alcohol. Remember when you get you antibiotic chemical from your doctor it says no alcohol on the label! Thanks for making this point about multiple substances. I discussed it in the previous post and one I wrote a couple of years ago about organic agriculture, so I left it out here. There’s also a strong possibility that the standards as set don’t represent the actual risk. One of the issues brought up by Que Choisir was the compounding of these dangerous chemicals that become another big threat that is more difficult to measure; there still needs evaluation for that. Then worst of all, the chemical compounds become amplified by alcohol which can heighten the health threat to extremely dangerous levels. Then of course, this is the just the beginning, there are hundreds of chemical additives dumped in wine during the so called winemaking process. That chemical soup we know is extremely dangerous for health let alone destroys any reality to wine. I have asked neurologists about this. They claim that this chemical-laced wine may be largely responsible for the dementia and Alzheimer’s epidemic in this country. I would advise anyone to discuss this with one’s own doctor. That’s why I do not drink wine (except some port) and I live upwind from huge vineyards. Screw them. Just boycott. I drink spring water with a little bit of naturally squeezed lemon juice. Screw wine, its too sour anyway. Screw chemicals. Screw chemtrails, screw winemakers. Screw cancer. I appreciate wanting to live with as little exposure as possible. But I don’t think you have to deny yourself wine in order to do that. We should have more access to information to make informed choices. If we have it, then wine producers will want to do better. Also, there’s a measure of degree. No one is suggesting drinking more wine than water. Pingback: What to Cook This October - Recipes, Cooking and more!